Super happy to let you know that we have had 100,000+ clients invest over Rs 2200 crores in the last 15 months on Coin. Even more gratifying is the fact that we have helped our clients save potentially tens of crores in commissions by enabling them to invest in direct mutual funds. Coin is today the largest direct mutual fund platform in the country. We also recently launched Coin mobile and the amazing response so far has been heartening. Today only 10 percent of retail investors are investing in direct mutual funds. A vast majority of the remaining 90 percent don’t know the difference between regular and direct mutual funds. To put this situation in perspective, In the financial year 2017-18, Rs 8500 crores was paid as commissions to distributors. Do help spread the word about direct mutual funds. It is a no-brainer today to switch from regular to direct mutual funds, especially if you are taking your own investment decisions. We have some updates on Coin based on feedback received from you. Most people get started with mutual funds by investing in tax saving funds. A couple of recurring questions that investors keep asking us are the difference between direct and regular and why the monthly fees of Rs 50 above Rs 25000 of investments. Most of the times’ these clients end up investing in a regular plan just to save this small fee. They don’t realize that these additional distributor commissions paid out continuously can add up significantly if they choose regular plans. Remember that if markets performed the way they have in the past, even a SIP of Rs 5000 in a direct plan over 25 years can potentially mean saving over Rs 28lks just in distributor commissions vs regular plans. Hence we decided to remove the monthly fee on ELSS completely and help investors make the smart choice of choosing direct mutual funds on tax saving funds which are typically held much longer. So, starting today, we are waiving of the subscription fee for all investments in Equity Linked Saving Scheme (ELSS mutual funds) or tax saving funds even if you cross the Rs 25,000 limit. That means, if you are investing only in ELSS direct mutual funds, you won’t be charged the subscription fee of Rs 50 PM even if your total investment cross Rs 25,000. If you are currently investing only in ELSS funds, you can click unsubscribe from Coin to avoid paying Rs 50 PM going forward. Check this post to know more about how to unsubscribe. On Coin, we simulate all SIPs. This means that each SIP is essentially a fresh lumpsum investment. We decided to do this because of the flexibility it offers. You can pause, resume, and modify your SIPs instantly, anytime you want without the need to submit forms or mandates, unlike other platforms. But a small drawback of this was that when a fund decided to stop accepting fresh lumpsum investments, you couldn’t continue investing in that fund. This only happened with a couple of popular small and mid-cap funds which decided to stop accepting fresh lumpsum inflows given the huge run up in these stocks. We’ve been hard at work to figure out a solution. Happy to announce that you can now invest in SIP of SBI Small Cap Fund, Reliance Small Cap, and Mirae Asset Emerging Bluechip Fund, or any other fund that stops fresh lumpsum investment in future on the Coin mobile app. For all such funds, we will switch from the lumpsum way of investment to normal SIP mode. This would mean though that like normal SIP’s you will not be able to pause/stop/edit amount/change frequency/cancel only if 10 days or more to SIP date. The investing process will remain the same though and will be available only on the Coin mobile app and not on Coin web. The mobile app is available on both Android and iOS. You can download it here if you haven’t yet already. We’ve also built a reporting module for mutual fund investments on Coin. You can now download the profit and loss statement for FY 2017-18 on Console – our new reporting platform. Currently, only the Tax P&L statement for mutual funds is available on Console. For the Tax P&L statement of all the other segments, you will have to check Q for the time being. Console will replace Q pretty soon and will be integrated within Kite. It is currently in beta, if you spot any issues, do let us know by filling in this form. Currently, we are testing out all the calculations. A host of analytics and visualizations will soon be added on Console over the course of the next few weeks. Coin indeed got a while lot better! ? I want to start this service. Please can your executive can explain this in detail. Thank you. We intend to keep this free for the foreseeable future. Brokers are not required to be an RIA as we are already registered with SEBI. I am waiting for this thanks Alot @ zerodha. Congrats, Nithin and team… Keep up the good work. This is really good news for me as an investor. I mostly invest in tax savings funds and was reluctant to invest as this monthly charge for 3 years was bit costly. Any best instrument How to select introday stocks or Any adviser if any. Zerodha is purely an execution platform only. We do not provide any form of advisory/PMS services or tips. Please go through Varsity in order to learn how to make informed decisions. In the new backoffice, can you provide the option to include buy price for an ipo even after it has been sold. Since the shares are visible in holdings only on the morning of the listing day, if I sell them soon after listing, then i dont get a chance to input the buy price and this affects the p/l statement. On Console – our new reporting platform, the prices will be updated on the listing day & you will be able to see the buy average of your shares. If due to some reason the average price isn’t updated and you sell the share on the listing day, you will still be able to enter discrepant for those shares. You can still transfer your existing investments to Coin & invest in ELSS for free. You can check out the procedure here. Please @NITIN sir…..help to save all “DRAWINGS” on chart to cloud……it is saved in browser cache and not visible in other devices. Drawings aren’t saved on the cloud. These are only stored on the local storage. You should offer free direct mutual funds on Coin. There are some websites that do that. I am not using coin just because of that. Rs. 50 is small for some, big for some. When you have a free way to do that, why not use the free platform. Every business has an inherent cost of operation and its not possible for a business to sustain offering free products or service. A business offering it for free will eventually have to charge you or find other ways to charge you for it if they have to survive. Investing is a long-term endeavour and it is important to consider this when selecting a business to invest through. Direct MFs in which user investes remains at AMC under user’s name even if platform used to start SIP is no longer there. So, long term investment is not platform dependent for MFs. 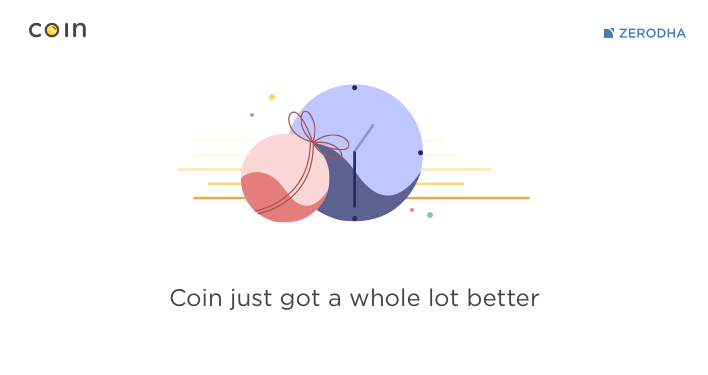 It would have been great if Zerodha had find a way to keep coin free. Keeping investments(stocks or MFs) attached to demat account might be increasing inherent cost? May be Zerodha can make coin free and offer robo investing assistant at a cost? I would love to keep long term stock investment and MF both under Zerodha. Currently monthly fee for coin is going against it. Nonetheless, good progress and good work by Zerodha team. Vijay, i agree with you. I have invested 40K in ELSS and 10K in L&T EBF, so will I be charged the monthly subscription fees? Because upto 20K of investment is free and ELSS is completely free. Please clarify, thank you! Log on to Coin -> click on account -> Once you do, click on ‘Deactivate subscription’ to unsubscribe. You will not be charged the subscription fee until your non-ELSS investment exceeds Rs 25000. If I have started Elss in regular method (not direct) what to do in this Case? You can discontinue your investment in the regular plan and continue the same on the direct plan. Once the lock-in period for the regular plan is over, you can redeem it & reinvest it. Kudos for the excellent platform you have built.You should have a escalation matrix for investor problems.I am unable to change my SBM to SBI in my demat even after trying 2 times. Everytime your people say–signature not matching.Please give me a solution.My last resort is–coming to your office in Bengaluru from Hyderabad. Entire India knows SBM is merged with SBI.They have to just change the IFSC.No change in account number. The IFSC numbers were changed for all SBM account holders after the merger. It shouldn’t cause an issue with your withdrawal payout. Could you please share the ticket number you are referring to, we’ll have this looked at. On Coin, If I invest ₹24,999 in regular MFs and then start investing in ELSS, will ₹50 per month be applicable to me?? also add all mutual funds in direct option…..like SBI small cap fund & Reliance small cap fund. The direct options of SBI small-cap funds & Reliance small-cap funds are already available on the Coin app. Thanks, i was not aware of that it is available on Coin app. I was searching on website & unable to find the same. I want activate this .How can I?? This will be applicable for you by default. However, be aware that your transaction in non-ELSS funds needs to be below Rs 25000 for this to be active. The limit of 25000 is monthly or anually or in a mutual fund only please describe. The limit of Rs 25000 is not time bound. Once you cross Rs 25000 worth of non-ELSS transactions, you will be charged the subscription fee until you redeem your non-ELSS funds and deactivate your subscription. I am having ELSS sip and already crossed RS.25000/- What shall I do? I am having ELSS sips only. Sir, I too have only ELSS investments.. What if I unsubscribe and in the future I need to invest more than Rs25k in non ELSS funds.. Can I resubscribe to coin again in the future? Yes, you definitely can. The moment your transaction in non-ELSS funds crosses Rs 25000, your subscription will automatically become active. Great initiative on ELSS which will attract new customers. Looking forward to see in number one spot with new features and initiatives. Yes, Investments in Direct ELSS funds are free. Please refer to this support article to know how you can download your ELSS statement. good work by the coin team! Coin now is lot better and good now to transfer all funds from other direct platforms. One thing i would request for having in Coin though. A curve chart of all ones net balance amount over time against the invested amount . This could be a game changer. will this be possible in future and why not now. We’ll pass this on to our team building Console – our new back-office platform. Question – If I have 80 SIP/ Lumpsum investments on different dates for one of my ELSS investment, then should I have to submit 160 duly filled DEMAT forms to convert it into DEMAT mode or only 2 form will suffice.? You will have to provide 2 DEMAT forms per date if the units are still under lock-in. For ex – let’s say out of the 80 SIPs, 44 are in lock-in period & 36 are free, in this case, you will have to submit 2 DEMAT forms for each of the 44 Dates & 2 for the remaining 36. So in total you’d have to give 46 DEMAT forms. It’s best if you raise a ticket in the same article you referred to earlier so that our support rep can guide you better. Every business has an inherent cost of operation and its not possible for a business to sustain offering free products or service. You can use the compare option on Coin web to compare different ELSS funds and select one that suits your needs. I am very happy for this bold move. Thanks a lot Zerodha. Coin interface is very basic in term of charting or show returns on investment. I was using unovest earlier which has some nice views show different stats of mf. Please bring the same to coin. Second, zerodha feels like no bias investment postal. I should request to add a module where a customer can get a recommendation for fund switchover in the same category if the current fund is under performing. The idea with Coin, or any of our platforms, for that matter, is to provide a clutter free experience with just what is required. We intentionally avoid adding noise to the platform to make decisions simpler. As for advice, we’d leave this on the investor as fund selection is dependent not only on the fund’s holdings, but the individual’s preferences and risk appetite. Great news! This made my day. Thanks so much team Zerodha. You guys truly standing by your investors’ side. First of all THANKS A TON in bring back favorite funds thru AMC SIP mode. I just have 1 Q: after my AMC SIP starts, i understand pause is not allowed.. but can i be able to increase/decrease the monthly SIP Amount ? Hey Sharad, you’ll have to cancel your existing SIP and start a new one with the revised amount. Any plan to start DSPBR microcap fund thru AMC SIP mode ? This fund has stopped accepting all inflows, Sharad. Only once they start accepting any inflows would we be able to list this on our platform. I have 75000 in elss amd 1500 in non elss funds so will i be charged 50rs pm or no?? Hey Karan, if your investments are above 25k, the subscription would have been activated. Go to the account section in Coin and click on Unsubscribe. Since you don’t have investments above 25k in Non-ELSS funds, your subscription would be stopped. Currently my ELSS are below 25k, and I’m investing in ELSS only currently. Do I still have to unsubscribe to not incur charges post 25k? I want to know the details of the coin. So happy to read new updates comming each time. I have been with Zerodh for past one and half year and I am so glad that they are very much into customer centric. Kudos to Zerodha team. Glad to know that the Coin’s subscription charges for ELSS funds have been waived off.. Its a good initiative, which will encourage a lot of people to invest in ELSS funds. I have only ELSS investments with Coin as of now.. So I am waived off the subscription charges. I am planning to invest in non ELSS funds in the future. So how will I be charged for this? Does the 1st Rs25000 investment be waived off the subscription charge? or will I be charged from the first rupee of investment in non ELSS funds. I have another query.. As of now, I am subscribed with Coin & I have only ELSS investments. Do I need to unsubscribe or the charges are automatically waived off? and what happens if I dont unsubscribe? Hey Abhinav, you’ll only be charged once you purchase over 25k in Non-ELSS funds. As for your current subscription, you’ll have to manually stop your subscription from the account section on Coin, else the subscription fee would continue to be charged. If the features and innovative products are given to customer .Even 100 Rs fee could be justified. For example Tax profit and loss showing long term and short term capital gain. Giving them an idea of how their collection of mutual fund is performing against benchmark over the time. Hi Shashank, check out console.zerodha.com. This is our new backoffice portal with tax P&L statements for mutual funds. As for tracking, we do provide an equity curve and NAV chart for reach fund. A comparison against a benchmark would be tricky since the benchmark for each fund would be different. In any case, we’ll bounce this of our team and will have it added to Coin if it’s possible. when SWP, STP will be activated in Coin? Also, one small request.. Could u please add the feature of comparison between two funds returns in the Coin app.. It will be very helpful. This means If I start investment now in ELSS through SIP from Coin then I won’t be charged anything? Also, please let me know the procedure for investing through Coin in ELSS by way of SIP. Hey Sumit, yes that’s right. No subscription fees for ELSS investments on Coin. Simply download the Coin app from the Play Store or App Store, log in with your Kite ID and password, select a fund of your liking and start investing. SIP amounts will be debited from your trading account on each SIP date. Really a good move. it will definitely bring more investors on this platform & infuse more investment. Yes, it will be waived off for existing investments as well. You just have to Log on to Coin -> click on account -> Once you do, click on ‘Deactivate subscription’ to unsubscribe. However, the value of your existing non-ELSS funds should be less than Rs 25000. How is COIN different from CAMS? Can I add existing folios in coin platform . Hey Shankar, yes, you can dematerialise these investments and track them on COin. Details here. If my non ELSS crossed 25K, apart from my ELSS balance, will the monthly charges apply only towards the non ELSS funds or is it applicable towards both the funds, on a monthly basis, from that point forwrd? Hey Akash, once the non-ELSS investments exceed 25k, the subscription kicks in. Since it’s a flat fee, there’s no concept of it being charged separately for ELSS and non-ELSS. As per instructions on your webpage for unsubscribing , it says we need to redeem all non-elss scheme to be able to unsubscribe. If non-elss schemes worth 25000 can be carried without getting charged then why do i need to redeem all non-elss mfs ? Bringing non-elss investment below 25000 should suffice right ? Is there an error on your part or do i need to redeem all non-elss ? Thanks for pointing that out! We’ll edit the text to make things clearer. Basically, this is a generic message intended to indicate that once non-ELSS investment goes above 25k, the subscription will kick in, and one would have to exit all non-ELSS investments in order to unsubscribe. Zerodha made my investments in Financisl market easier, simplest and low cost. You are doing a great job Mr. Nithin Kamath. Hats off. I have a question. Is the above mentioned offer of no commission for limited period or is it the way forward which stays forever?? How to convert Coin SIP to AMC SIP? Thank you Mr.Nithin for waiving off the monthly charges on ELSS funds. Great news.. thanks Zerodha.. been waiting for that tax P&L statement for mutual funds for a while now..
Also congratulations for being the 2nd largest broker in India..
Great…. Announcement… Good Work… Thanks… Team Zerodha.. This is indeed a great move, however curious to know how does Zerodha benefit from this? Thanks a lot for this Sir! One query, i have invested only in ELSS and paying the subscription charges every month. in this case do i need to unsubscribe from coin or the subscription charges are automatically stopped deducting? and if i unsubscribe from coin, can i still invest in ELSS funds? You’ll need to unsubscribe from the account page on Coin, Bhushan. Thanks for the reply Matti ! will i still be able to invest more in ELSS if i unsubscribe? Why can’t you suggest new beginners what to buy and what not? That would be great help for trader/ investor who has just started. When it comes to people offering trading or investing advice, what you need to ask yourself is ‘Why would anyone tell me what to trade instead of taking the trade themselves?’. At the end of the day, the way one looks at the stock markets is quite subjective, and it’s best that you make your own decisions. Great work zerodha keep doing this work!!! Very soon you will become largest & gretest brocker in all categories in India. Is Axis long term equity direct growth fund be counted as ELSs? How can I move from other platforms to zerodha? I have a lumpsome payment. I want to invest the whole amount in a good liquid fund. I want to do STP with good Equity fund. Now I am doing sip which is working fine. Dear sir, good go forward like ISRO success rate. Can you please explain the last two lines in the text below, You are saying there is no fee and again you are telling there will be Rs 50 PM going forward, I am not clear on the below. Hey Manoj, this is because until now, the subscription was applicable to all types of funds, including ELSS. Since we’ve now waived of this fee for ELSS funds, if one is already paying the subscription fee, one can click on unsubscribe to stop paying. How to identify in Coin as to which are ELSS? I am already existing user of coin and however i have investing in below funds also. but For these Funds,around last 2-3 months ,i can’t able to buy from coin through direct or sip(Order getting failed). However i have seen in this blog saying. we can able to setup sip for below fund also through “mobile app coin”. so please let me know if i make it as SIP through mobile webapp ,will all amount(existing invested amount) will be carried to same fund only right ? Yes, you can use the mobile app to continue investing in these funds. I tried to do SIP for my EXISTING mutual fund (“Aditya Birla Sun Life Tax Plan – Direct Plan – Growth” to SIP) . **let me know how can do setup SIP for my existing SIP== let me know how can i setup ,SIP for my existing MF. and even i have raised ticket as well . no is= 20180810530587. Hey Ajay, sorry about that. The Aditya Birla Fund has stopped accepting all fresh investments. I would strongly recommended Zerodha team o make IPO available at your platform , My family have been using Zerodha for a year , but when it comes for IPO application , we have no options lefts apart from missing it , we know that an be done by even netbanking but again tracking your investments through multiple channel sometimes needs more deal then what we expect for. So , my humble request to Zerodha team is , please work in the procedure (my be SEBI registration or anything which is required) to make IPO available to us. Hey Abhishek, this is on our list of things to do, but will take us some time. As for losing out IPO opportunities, as you’ve said, you can simply use the ASBA application from your netbanking portal. While applying, if you enter your Zerodha demat account number, then you needn’t track these investments elsewhere either. They’ll show up in your Zerodha holdings post allotment. Great initiative, I have a question. How to find all the ELSS funds existing in coin? I do a search by elss in coin portal, it does not display the information. Rather, it has all the funds categorized by it’s name to search for. If we have a functionality were it displays all the ELSS mutual funds together, it would be a great. Hey Vishal, I suggest you install the Coin mobile app. In the app, you can filter by fund category, minimum investment amount, AMC, CAGR, etc.,. Is there any way I can transfer my existing ELSS investments to coin? I decided to go direct because of the monthly fee. I subscribed it directly using website. I have three ELSS SIP’s with Reliance, ABSL, and Axis. Investing thru coin for SIP is still a difficult task, each month I need to manually transfer from from bank on or before the due date. If it is auto debited from the bank account it would make life lot simpler. In future can we expect to see the breakup on “Other Credits and Debits” column in the Report? I am not quite sure what is this! In case I use COIN App to invest in Reliance Small Cap Fund that is already in my portfolio but not invested since last 3 months, what is the process to stop the SIP/change the amount if i need to? I addressed you as a captain, because we are part of a team which you are leading. I think , while running your business , you also doing social service in the form of reduced cost to your customers. Lot of investors, including me are praying for God’s blessings to you. As earlier I have suggested, if possible , Zerodha should start it’s own mutual funds also to further reduce the cost to its customers. I also request you to issue shares of Zerodha to its customers so they can also become partners in the progress of Zerodha and feel themselves as part of Zerodha. Coin app is not updating NAV timely. It’s taking more than 15 hours to show updated NAV. Currently, in Coin P&L shows absolute returns which is ok but there must be an option to see Annualized P&L which gives more clarity on how the funds are performing. I have three SIPs and 2 lump sum investments now for than a year. These are with CAMS. Would it make sense to transfer these to COIN, and would it reduce costs if any? If so then what kind of costs would it reduce and to what extent? Pl. let me know. Hey. We show historical returns. Expected returns would just be expected guesses at best and as such, not something we’d want to show. This could potentially hamper your decisions when choosing a fund. You can indeed transfer mutual funds to Coin from elsewhere be dematerialising them. 🙂 Details here. I’m still wondered why this page is not designed even Zerodha got some talented designers. Listing 1000s of funds like this is definetly not a good idea and we have no idea which one to purchase. So please make it something like https://www.smallcase.com/discover so that we know the important metrics and sort options. When I received the mail, I thought you’ve revamped this as well since I first requested this last year. Great initiative. For retired senior citizens like my father, who wants to invest in small SIPs in ELSS funds only as a tax saving mode as other long term methods like PPF do not make sense anymore because of lock-in period, this is a very welcome and helpful move. Does the Zerodha’s AMC SIP feature levy any charges if there is shortage of funds in zerodha account on the day AMC SIP is triggered? No charges, Sudheer. If you don’t have enough funds, order placement fails and we’ll try again on the next instalment date. So regular ELSS MF are still chargeable right? We don’t charge for any regular investments, ELSS or non-ELSS, but you would end up paying huge commissions. Good Job Nithin – but still a Long way to go. Chronic problems with Tax P&L for Equity etc – and you must have Tax P&L working for current FY too. Regards and wish you all the best. A great initiative to exclude elss fund from the chargable subscription as this helps a lot of small investors.. I have invested 5k in non-elss funds and rest in elss funds, so should i stay subscribed or is it mandatory to unsubscribe for monthly charges of rs50 to stop? Hey Janak, if your non-ELSS investments are below 25k, you can unsubscribe in order to stop paying the Coin subscription fee. Positive thing about SIP through COIN is it can be paused, restarted, modified. However, if a MF scheme stops accepting fresh investment, would SIP in “lump sum each time” format work…? e.g. A user started SBI Small Cap SIP through COIN in 2017Jan, and SBIMF stops accepting new investment for SBI Small Cap from April2018. Will Coin SIP (“lump sum each time”) still work after April2018 as I started investing a long before they stopped taking new investment…? Can Zerodha give the mutual fund list separately like Large cap, Mid cap, Small cap. Great work in adding AMC SIPs . That was the only missing feature. Was doing that via ICICI direct. will stop there and continue in Coin. However, 4 days of SIP are till 15th of the month. After that there is a long gap of 15 days . If you could create more SIP dates or expand the gap of 4 SIP dates to cover the whole month , it would help a lot . ( For eg: dates like 1, 7, 15, 22 etc.) . It would help folks who spread out their SIP for a scheme through out the month. Hey Ajesh, while we can offer flexibility in our SIP model, the dates available for AMC SIPs are severely limited on the AMC end. Is there any online platform by Zerodha to invest in IPOs and the rights issue being offered ?looking forward towards a pragmatic solution for online platform by Zerodha for online subscription in IPOs.. I am investing in SIPs currently and my total investment already crossed the 25000 mark. I have an ELSS fund in my portfolio. So, what will be my benefit in the Rs. 50 per month charge? Hey Debojit, if your total non-ELSS investments are below 25k, you can go to the account section of Coin and unsubscribe from Coin and enjoy free investing until such time as your non-ELSS investments go above Rs. 25,000. I invest Rs. 6000 per month and 1000 of them is in elss. I think i will ha e to pay the price. Can one unsubscribe from coin and still invest in sip. Any update on pledging of mutual funds. I know ETF is another option, but the problem with ETF is that there is liquidity problem barring 1 or 2 funds and there are slippages on the NAV price vs trade price. Hey Sachin, we’re working on taking this live. Hopefully, it should be done by the end of the month. I have already opened a demat account with Zerodha for equity transactions(probably with IIFL accounts). I’d like to know the procedure to open an account in Coins also after this move. Can I do this online? Can you please explain it further …. Happy to announce that you can now invest in SIP of SBI Small Cap Fund, Reliance Small Cap, and Mirae Asset Emerging Bluechip Fund, or any other fund that stops fresh lumpsum investment in future on the Coin mobile app. For all such funds, we will switch from the lumpsum way of investment to normal SIP mode. This would mean though that like normal SIP’s you will not be able to pause/stop/edit amount/change frequency/cancel only if 10 days or more to SIP date. Because i currently have Reliance Small cap fund in my portfolio which is now paused. Can i resume it on the mobile app? or do it need to start over again?? Are there any plans to integrate offline and other DEMAT investments with zerodha.. This is very lengthy process @Zerodha. I know they are not brokers. Hey Ritesh, we only support demat investments. So, if you have mutual funds in physical form, you’d have to dematerialise them in order to add them on Coin. If you have demat investments elsewhere, you’d have to shift them to the Zerodha demat account. Also, when the investment is in demat mode, the folio number is irrelevant, so it wouldn’t really matter. I have total 4k invested under ELSS in coin.Do I still need to unsubscribe? If your investments are below 25k, the subscription wouldn’t have kicked in, so there is no unsubscription. Yes Jainam, all ELSS investments are absolutely free. I’m happy I selected a best tool to invest my earnings ! After your announcement i have have brought dowm my non-elss investments from 31k to 24k.But your Coin dashboard and app shows my investment to be 31k and so i cannot unsubscribe from coin.Can you help ? Moreshwar, you should be able to see the unsubscribe button on the accounts page since your non-ELSS investments are valued less than 25K. Can you raise a ticket here if you are not able to see the same? I had a query earlier too. Will I be able to see the Unsubscribe option even if I am investing only in ELSS(currently my investment is still under 25k). Cos given my situation, if I still have to then I cannot see the button. Such an application design feature makes things easy. Thanks a bunch!! ??? Hi. I had invested in Tax saving MFs in March 2018. Accordingly Coin Subscription Fee was been debited to my account on monthly basis. My query is, now that Coin Subscription Fee has been waived for Tax saving MFs, will I still be charged the Coin Subscription Fees of Rs. 50+ GST? Do care to read the post. i currently have Reliance Small cap fund in my portfolio which is now paused. Can i resume it on the mobile app? or do it need to start over again?? Yes, you need to restart the SIP on the Coin mobile app. If I withdraw all my non elss investment and keep only Elss ones.. then is it going to be free.. Asking just to know that 25000 limit was on transactions or total investment on current date. I start SIP of rupee 1500 ( mirae asset tax saver direct growth fund) per month. Now Please tell me, Is next installment will be deducted from my bank account or my zerodha account.? A good initiative by Zerodha,also if you could come up with something for IPO s also. Is it only the ELSS schemes for which the commission has been waived off, or the other forms of SIP come under this purview? if no (for other forms of SIP), then is there any plans where the commission would be waived off for all types of MFs. 1. Is coin now free even for any lumpsum investments in mutual funds or is the fee of Rs. 50 waived for ELSS only? 2. Can investments in NFOs and NCDs be made through Coin ? I do not find new ones in the list of Funds provided. 1. Its free for all funds with immediate effect. Nobody help me for how to invest through Zerodha. Yogesh gupta regularly call me for account opening,but after account opening nobody contact me. And i have no contact no of zerodha customer care . Is there an elss which holds stocks like etf ? Like nifty etf or bank nifty etf ? Does investing in Direct ELSS funds through the fund provider website and coin platform is same in terms of cost incurred by the investor? Are there any hidden charges, if we invest through Coin ?